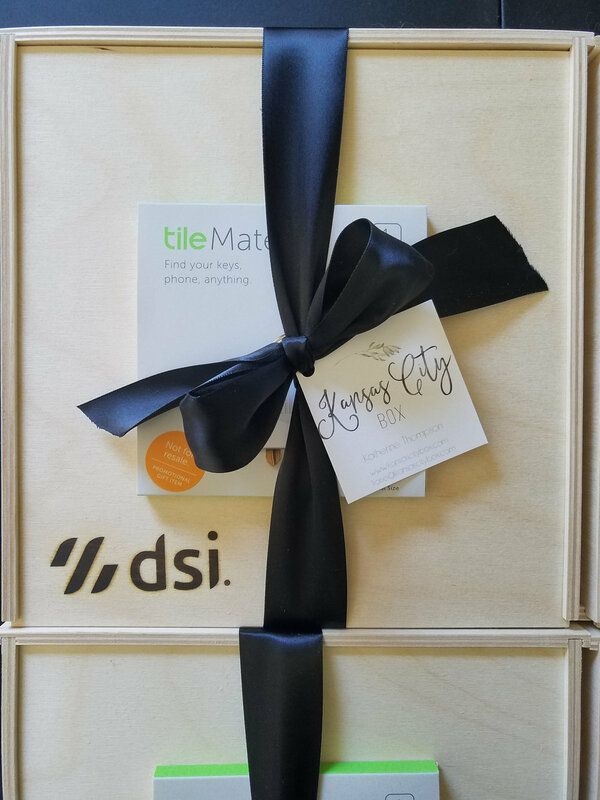 Kansas City Box provides a refreshing new approach to corporate and client gifting. We create truly personalized and elevated gifts for clients of all sizes. 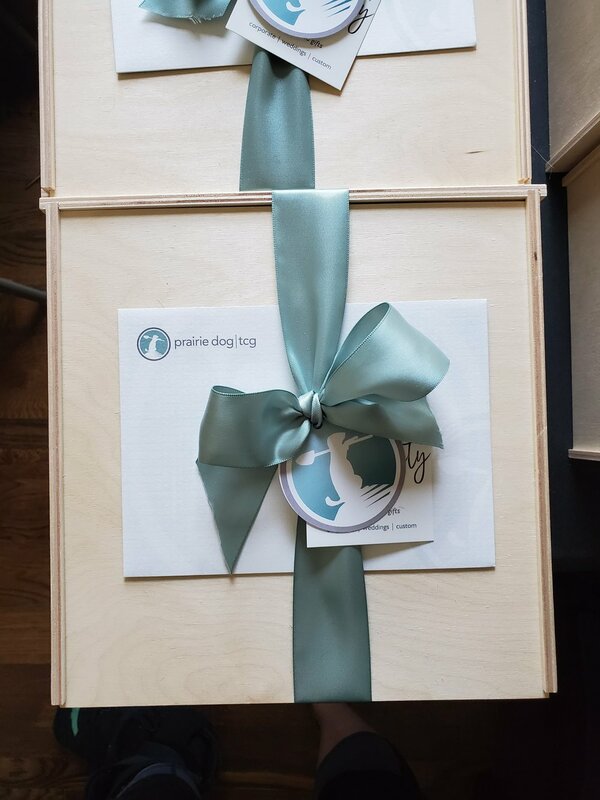 Whether you’re a business of 10 or 5,000, we will design a gifting suite that fully captures your brand and leaves a lasting impression. Corporate gifting is an important investment; let us help you deliver locally sourced, elevated, and memorable curated gifts to the people who matter most. We're perfect for business-to-business gifting, holidays, client and realtor gifts, weddings, product launches, and event favors. Our team handles absolutely everything from start to finish. Real people, in our Kansas City based studio, sourcing unique, local, brands and products, designing branded collateral, hand packing, hand-writing personalized notes, and even taking care of shipping and logistics. Q: What makes us different from our competitors or your standard gifting service? A: Our love for supporting local. Our gifts bring an interactive component to the gifting experience. Every gift comes with an informational insert allowing the recipient to navigate the local roots of their gift. The informational insert comes with a QR Code to redirect the recipient to the Meet Your Makers portion of our website. 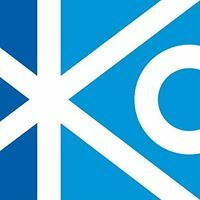 Here they can explore photos of their products, learn about their local makers, the gifts origin, discover website and social links to the 70+ local vendors the Kansas City Box curates. 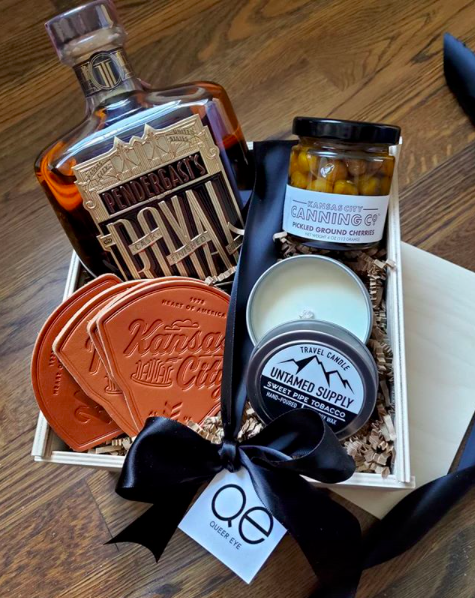 Additionally, in less than two years Kansas City Box has grown from a one-woman shop to a small team that ships hundreds of gifts monthly, we have extensive experience in creating beautiful gifts for all occasions. Producing many of the gifts in house and in collaboration with the local vendors allows us to offer virtually endless opportunities for customization and personalization, even at low quantities. We are equipped to handle wooden box branding, screen printing, laser cutting, engraving, letterpress - you name it! We can incorporate your company’s brand into the theme or color scheme, branded glassware, apparel, accessories, stationary, collateral, and even private label items. Need gifts on a rolling basis for new members or client thank you gifts? Don’t meet our gifting minimums? Enroll in our gift on demand service. With this service gifts are paid for in advance in order to receive bulk discounts and customized gift solutions. Kansas City Box will store your gifts for you. When in need of your next gift you send us an email and your gift will be delivered within 48-72 hours. This service is most popular with realtors, new member gifts, client thank you or client achievement gifts. This service is available for clients hosting large events outside the Kansas City Metro. Gift concierge service is available for any order over $10,000 or 500 gifts headed to a single location. 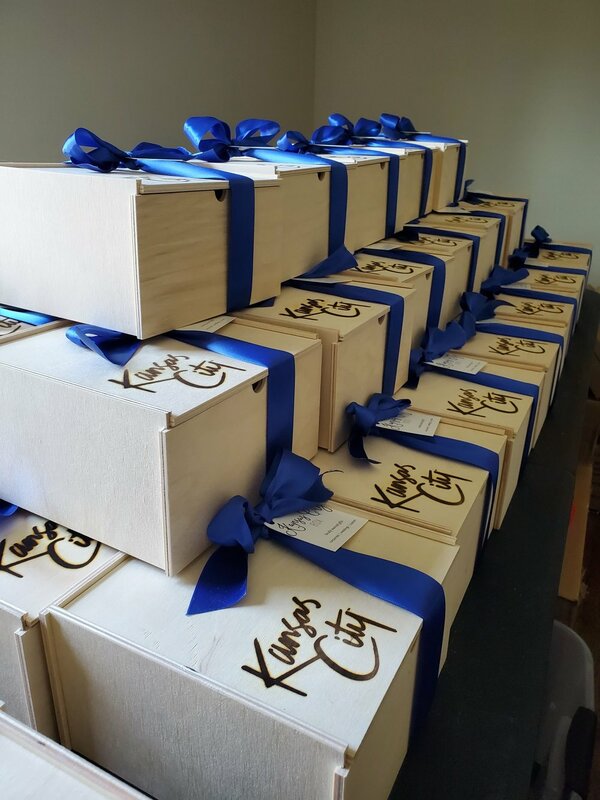 For an additional fee, a Kansas City Box team member and the lead of your corporate account will handle all gift logistics with the final destination including traveling to the location to ensure gifts are shipped in tip top shape, quality and integrity of each gift arrived intact, and the logistics of the shipped gift to the recipient goes smoothly. This service is most popular with large weddings and corporate events where hotel logistics are involved. The additional fee is dependent on number of gifts and location. Whether you’re welcoming new employees, celebrating a holiday, launching a new product, or just saying thanks, we’ll create the perfect gifts, customized exactly to your needs and budget. You can just sit back, relax, and take all of the credit. For more information fill out the form below. Let’s work together! Interested in learning more? Would you like to view a formal proposal? Fill out our short QUESTIONNAIRE below and a team member will be in touch shortly. How Did You Learn About The Kansas City Box? Shipped gifts are protected in a corrugated cardboard box, packed with eco-friendly packing materials, and shipped via FedEx to your intended destination. For multi-destination gifting suites we handle all logistics for you. We request a spreadsheet of recipient addresses and any necessary information. From there we individually hand pack each gift and individually track every package to ensure they arrive safe and sound at their intended destination. We closely track all gifts but do provide all recipient tracking information for your records. 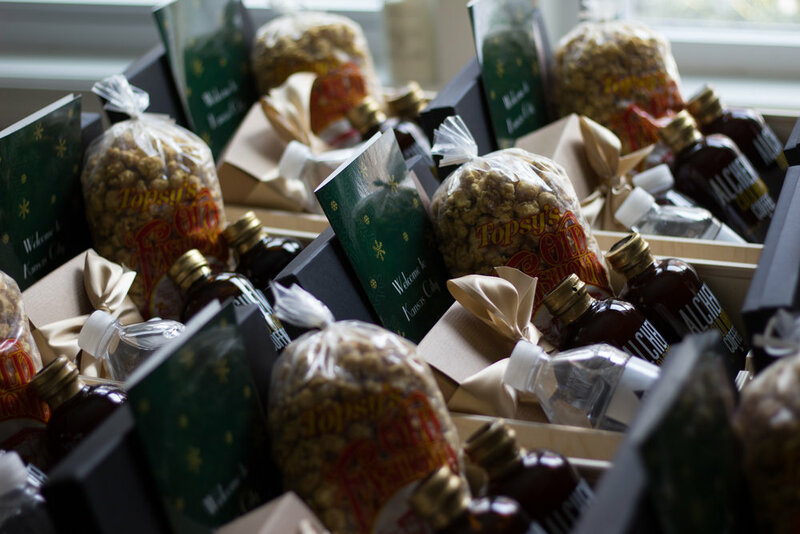 Bulk and freight shipping available - most popular for hotel welcome gifts, out-of-state conferences, and weddings. All hotel logistics managed for you. Located outside the KC Metro? Non-KC Branded Materials are always available. 1-3 Business Days: Answer a few questions in the form below and we will respond to your request with curated gift box ideas based on the occasion, business, and budget. 3-4 Business Days: After our initial discussion, we will work to fine tune your gifts and discuss incorporating your business marketing materials and/or specialty items which you feel represent your business and occasion appropriately and beautifully. This process can be completed entirely by email or you can schedule a complimentary consultation here. 2 Business Days: Once we have decided on your gifting we will send you an invoice to review. You will have access to your invoice and gifting details on the password protected portion of our website. Here you’ll have access to past and present orders including any customer notes and questions. Once payment has been received we'll take care of the rest! 3 Weeks: The ideal lead time to execute branded gifts, incorporate all branding materials, and curate your gifts to perfection is approximately 3-4 weeks. If you have a shorter time frame that’s okay, too, we’ll always work with you to find the best solution for all parties involved. Our current B2B minimum is six gifts starting at $49 per custom gift box or a gifting suite totaling $500 or more. If you have less than the requested minimum please reach out to us below or email us at hello@kansascitybox.com and we will be do our best to accommodate your request. Please note: Due to demand, turn around times for inquiries between Mid-October-Early December can be a longer than stated above and/or delivery dates will sell out. If you’re interested in 100+ gifts delivered during the last week of November through the first week of December please reach out early.